We have three locations celebrating and our 26th year in business. There is no secret to our success. 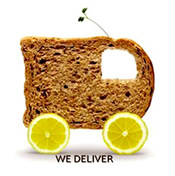 We make and sell fresh food. We only use natural ingredients and have no need for obscure chemicals, preservatives or artificial flavors. We will never buy from sandwich and salad factories or sell you a "thaw and serve" product and call it "always fresh". Please CLICK HERE for the location nearest you.